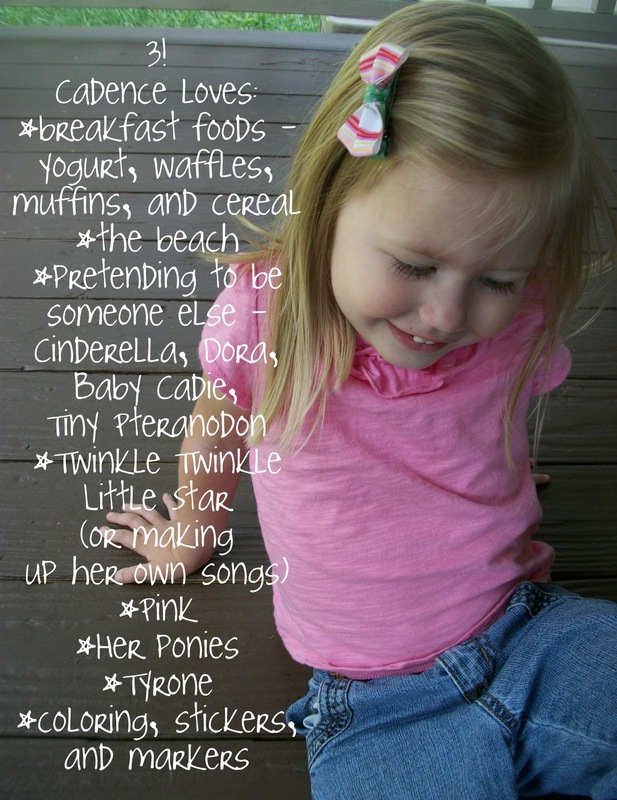 Since her birthday last month, I've been meaing to do a faves list for Cadence, like I did when she was 2.5 here. I took this picture a few weeks ago while we were playing on the front porch, then added the faves (with some consultation from her) using picnik - a free web-based photo editor. Besides her faves, we can also report that Cadence has a rich imaginative life, going entire days assuming the identity of another character and assigning other identities to the rest of the household. I feel like she's eating better these days, and she's 99.9% potty trained, and has been for awhile now, after a few setbacks with the move and the new sister. This summer she started to break out of her shell and actually talk to people, which was a relief, and a delightful surprise for many of our friends in this community. She asks lots of interesting questions, like "Is your tummy small now, Mama?" and "Where does Jesus live?" So, we're proud of her. Our beautiful girl and all her favorites. She is growing and doing so well, she is so smart! Her personality is so adorable. We are so proud of her! I love this picture and the way you put this together. Very nice and something she will enjoy seeing some day. Piper is smiling for real!